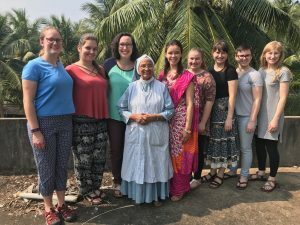 India Joy Giver Experience - Day 5 - Resounding Joy Inc.Resounding Joy Inc. 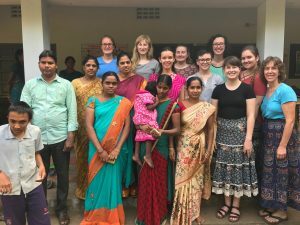 The Resounding Joy India team’s first site for the day was a care facility for older adults. This was the second time this week that the team facilitated sessions in this location. The team was well equipped and mentally prepared to take on this group of clients for the second time, since they discussed the previous night how to better work with individual clients while still being in a group setting. The group had a wide range of skills and many of them were addressed and driven by the team members. Being able to adapt on the spot seemed to flow and come naturally to the team with this group today since the entire session was very coherent and has been the best one yet. We first worked one on one with clients that could not join the session that was to follow. 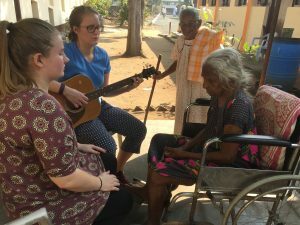 Providing music therapy to these people is extremely important as their daily lives are harder for various reasons. Music therapy allows them to work on things such as pain management, stress and anxiety, as well as motor and tracking skills. After the individual sessions, we started by singing a Telugu song that the group knows to gather them all in the same spot. 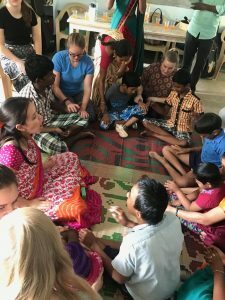 Once everyone was settled, one of the team members co-led the hello song with Annela and went through and asked each member of the group how they were doing today (also in Telugu). The team then went into a passive proprioceptive exercise. The team assesses what specific clients needed in that intervention and went right into modeling, or providing hand over hand. The following intervention consisted of using a song with guitar and instruments that were handed out for each client. A couple of times during the song, the SMT prompted the group to stop and the team would track each client and their progress. Some team members worked on range of motion during this intervention as well to get their bodies moving. The next intervention was a drumming and chant intervention. One client played the buffalo drum to keep the beat while everybody sang, and then they would pass it to the next person. This was a great intervention for the particular group because it gave them a chance to have control of something which isn’t usually the case in their daily lives. Moving on, the clients were put into groups of 3-4 and given an egg shaker. The SMTs played a melody and sang, giving them specific directions on what to do when they passed the egg. Some examples: pass to the left/right, speed up, slow down, and stop and start at different tempos. This was a really great was to work on tracking as well as getting them moving and interacting with the group. To finish, Annela played a relaxing improvised melody on a native American flute while two other team members played guitar and drum. This facilitated a relaxing and calm environment. This session encouraged to the team and we felt like it was our best one yet. We are ecstatic that the teamwork that we display on a daily basis really drives our session and gets significantly better every single time. We also got an enriching learning experience at a school for students with special needs. As it was our first time at this school, we were not sure what to expect. 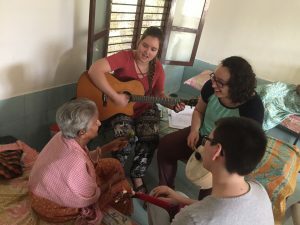 We began with a group music therapy session with eight students and a few mothers. Our team assessed, planned, and adapted by using our routine from the other special needs schools. After a quick snack, we split up into smaller groups with two or three student music therapists and one to four students. Our team was a problem-solving machine. We worked together to overcome the language barrier with music therapy interventions centered on the music. I learned ways to engage students by asking simpler tasks. Instead of identifying animals or repeating rhythms, my group discovered that it was more appropriate to play the instruments in front of us for a moment and then identify skillsets we could use from there. Each group was able to rotate once to another set of students. 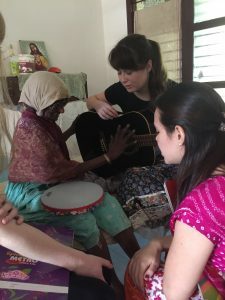 My SMT partner and I had the chance to work with a five year-old girl, and we successfully identified that the goal was to engage this child in music play. We sang “In the Jungle” and bounced the child up and down or had her sway in our laps to encourage her to differentiate the verses from the chorus. We learned a lot about communicating with each other during co-facilitated sessions and had a lot of fun doing so. We ended our session as a group by coming together again with twenty more students from other classrooms. We sang, moved, and played instruments together. It was ideal to have seven SMTs available to assist with this large number of students. We agreed that these experiences offered a lot for us to consider and apply to our sessions back in the US! 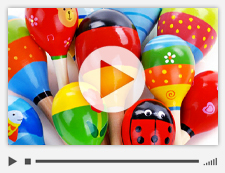 Footage includes Joy Giver volunteers during a visit to a San Diego assisted-living facility, where they engage groups and individual residents in song and use of simple rhythm instruments. Look for a Joy Giver playlist after viewing this first video.